First of all tyvm for the awesome tool. After that I go to Analyze -> Quick Search -> Write -> restart but the sector size is 512 and still raw after the restart..
filewin32_getfilesize(\\.\I:) GetFileSize err Incorrect function. filewin32_setfilepointer(\\.\I:) SetFilePointer err Incorrect function. 5 dr-xr-xr-x 0 0 0 15-Oct-2014 02:06 . 5 dr-xr-xr-x 0 0 0 15-Oct-2014 02:06 .. 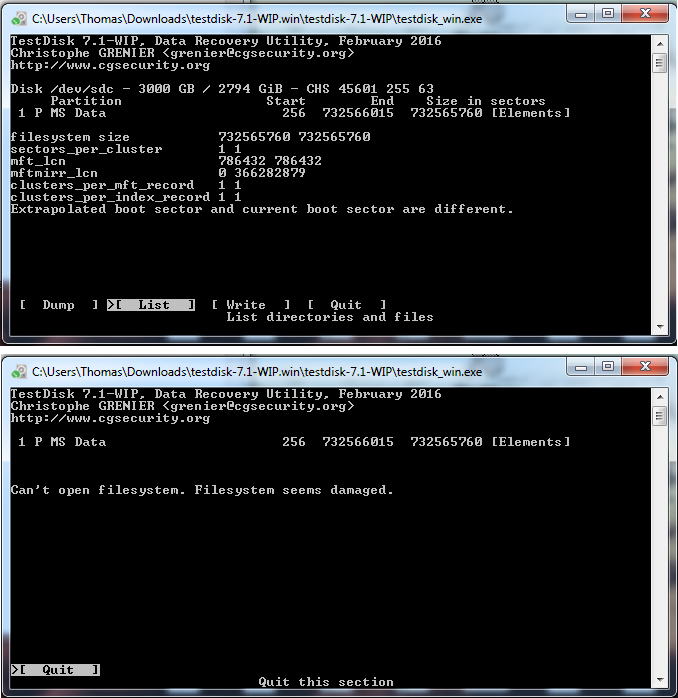 I've changed the partition table type into EFI GPT which made all the partitions to merge again. I changed the sector size to 4096 again but I'm unable to write since I get a "Partition: Write error". Last edited by thaskasw on 04 Mar 2016, 21:11, edited 1 time in total. Run TestDisk, keep the same sector size, Advanced, Boot, RebuildBS, List. If you can see your files, choose Write, confirm, Quit and reboot your computer. If it works, you should run TestDisk again and this time, try EFI GPT, Analyse, Quick Search, List. Thank you for the reply mate. I got an error when I tried that. Will upload a screenshot in a second. I definitely had a chuckle when I read this post. I am currently having the same problem with the same HDD. Have a western digital 3tb and had a problem with the power adapter. the data transfer port broke, not allowing me to plug my usb data transfer cable into the HDD. ended up taking the HDD out of the case, and plugging sata cables directly into the HDD but now it was asking me to reformat. tried a data recovery program, and it recovered about 10k media files (i have over 50k). now i am running this program and it has been the only program to actually recognize how i had the HDD organized. recognizing file names such as "media, movies, tv shows, etc"... currently copying files and so far so good. everything has been able to be read by the program and has been successfully copied. although, only at about 4k files, so still a lot to go.